TRU’s first municipal polling station brought 280 staff, students and faculty to the TRUSU lecture hall to cast their ballots Nov. 13. Leif Douglass, TRUSU vice-president external, said bringing a polling station to campus was first discussed in 2011 after the last municipal election and became a reality two years later in 2013. 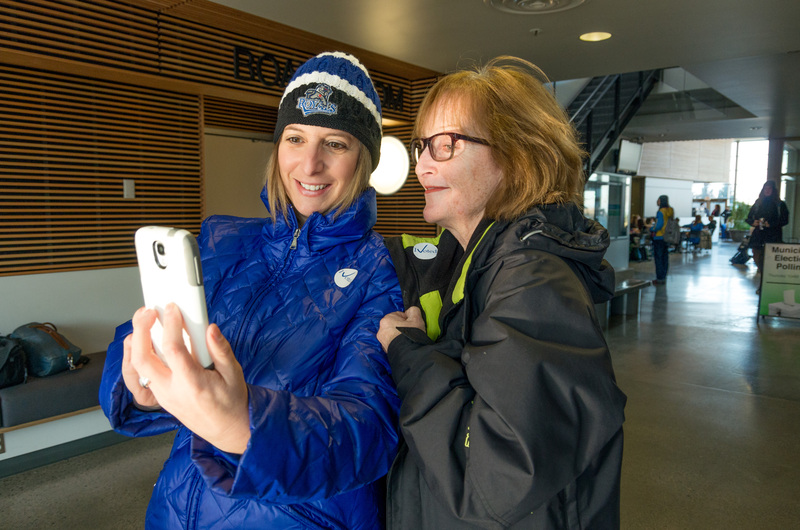 The City of Kamloops hosted advanced polling stations Nov. 5, Nov. 6 and Nov. 12. 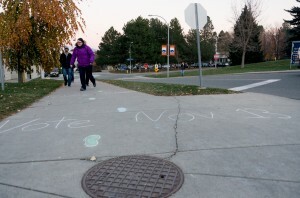 The Nov. 13 polling station on campus, however, was classified as a “special voting opportunity” reserved for staff, students and faculty of TRU. “At an advance polling station, anyone from the public could come and vote,” Douglass said. Student Katie Janicki said she thinks the on-campus polling station made voting more accessible to students. The fourth-year art and communications major has been in Kamloops for the last five years, but did not vote in the last municipal election. “If you’re living on campus you have that opportunity to go, just conveniently, without having to go on a bus or go downtown or anything, and I think that’ll get more people involved,” she said. Fellow student Nathaniel Goyet-Lamoureux expressed a similar opinion. “I don’t think I would have time to vote somewhere else,” he said. Fourth-year arts student, Blake Maicher, on the other hand, said that while he knew there was an upcoming election, he was not planning to vote. “I’m not from the city and I feel like…the impacts that this election could have wouldn’t come in contact with my time here in Kamloops,” he said. While election fever took over Kamloops in the last few weeks before the election, Kamloops Vote 50, a local non-profit that was looking to increase Kamloops’ voter turnout from 29 per cent to 50 per cent (or higher), paid special attention to TRU in the days leading up to the polling station. On Nov. 12, TRU voters got to come face-to-face with election candidates and ask questions during a meet-and greet-outside of Old Main. Students then arrived on campus Thursday morning to find lines of rainbow coloured footprints drawn on the sidewalks, converging on the TRU polling station. Chalk messages every few feet reminded passers-by to vote. George added that while Vote 50’s mandate ended with the general election Nov. 15, he hopes any effect the campaign has had will carry over to future elections. “If you have a more engaged voting population for the local election, the federal election is just around the corner, so we’re hoping [Vote 50] will be a short-term initiative with long-term effects,” George said.